The majority of laboratory chemical spills can be cleaned up by lab personnel. In order to facilitate the efficient clean up of these spills, the Department of Environmental Health & Safety has developed a universal chemical spill clean-up kit. This kit is compact and will not take up valuable research space. The supplies are simple and universal for most chemical spills. Even though the kit is user friendly, training is still required in order to use it. After purchase, DEHS willprovide training to your laboratory group. The purchase of the University of Delaware Chemical Spill Kits is confined to University staff and employees. Restocking or replacing existing Chemical Spill Kits will conform to a uniform standard approved by the Department of Environmental Health & Safety. Refer to the Laboratory Chemical Spill Clean-Up Procedures. These procedures were developed to give guidance to knowledgeable researchers on the safe and effective way to clean up small laboratory chemical spills. 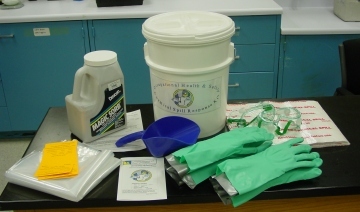 After a Laboratory Group purchases the initial Chemical Spill Kit, the Department of Environmental Health & Safety furnishes replacement supplies at no cost to the lab. The initial cost of the kit is $80.00. To purchase Chemical Spill Kits go to UD Webforms, log in and look under Description for "Laboratory Chemical Spill Kit". If you need replacement supplies please e-mail Brian Miani. The purchase of the University of Delaware Chemical Spill Kits is confined to University staff and employees. 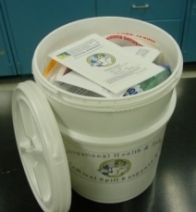 If you have any questions regarding Chemical Spill Kits, please feel free to contact Brian Miani or call 831-8288.